Jerzy Białobok, associated with broodmatrons. Krzysztof Duzynski, Irina Filsinger, Michałów Stud since 1977. 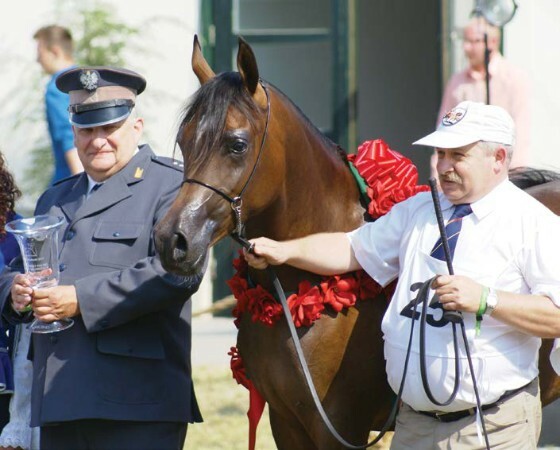 The stallion that has had the greatest influence on our domestic breeding in recent years is Ekstern – says Director Jerzy Białobok, associated with Michałów Stud since 1977. 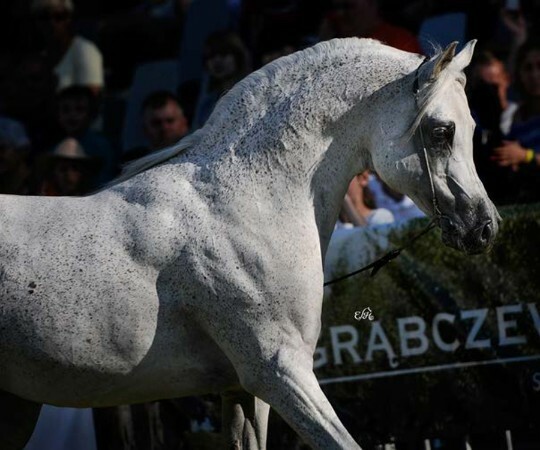 The past year was a special year for Michałów and Polish breeding – it’s because one of the most outstanding Polish stallions, who has already written himself down in the history of pure bred Arabians, celebrated his 20th birthday – EKSTERN (Monogramm – Ernestyna/ Piechur). 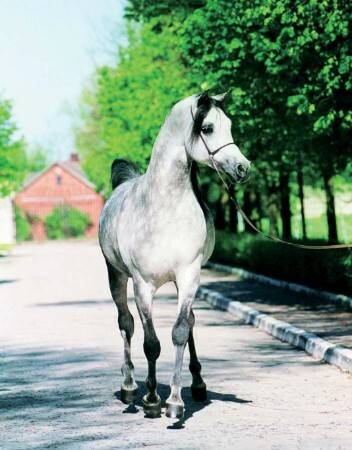 Today, at the age of 21, he is still taking up the position of chief sire at Michałów Stud and is often shown to the stud’s guests – that’s when he reveals his phenomenal movement and charisma, unchanged despite the years gone by. He is one of those stallions that are referred to as “epoch-making”. An epoch-maker was Ekstern’s sire, Monogramm. Epoch-making were his ancestors, including Ofir and the line’s founder, the desert-import Kuhailan Haifi d.b. 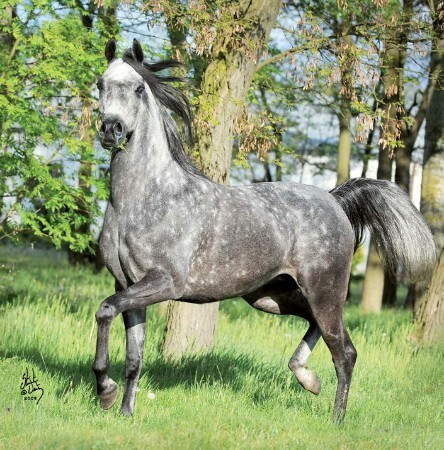 But their “epochmaking” accolades stem from the fact that among their descendants was an Ekstern, not only the most highly decorated Polish stallion, but first of all a sire of champions and important broodmatrons. 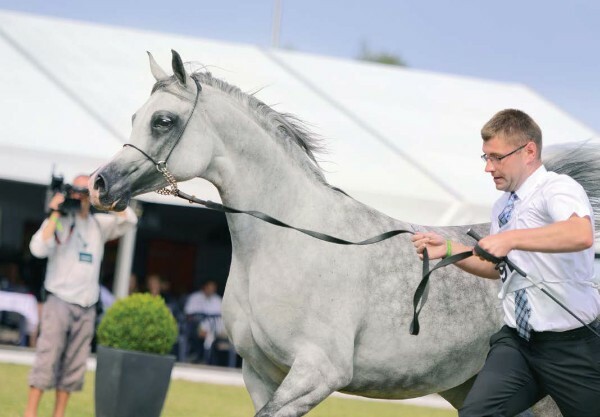 King of the Ring The main breeder at Michałów Stud, Mrs. Urszula Białobok, recalls that Ekstern made a great impression from the very beginning: “We were waiting for a stallion, we had a feeling that from such parents – an excellent dam and superb sire – something promising can be born. And we were not disappointed”. 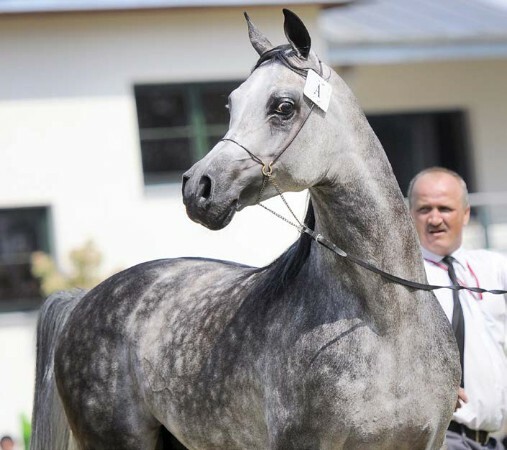 Director Jerzy Białobok confirms: “Already during his first days we could see the great beauty of this horse. What I always liked most were his eyes, prominent, full of expression. He revealed his great movement during his first walks with his dam. Young Ekstern used to run in front of his dam, trotting with a visible spring in his step. He looked like a very elegant horse, closed off in a squarish outline, more Egyptian than Polish in type. That’s what I always thought of him – that he could just as well be a representative of an Egyptian line. This concept was further supported by his neck – although it was nice and shapely, exactly the case. Professor Krystyna it was a bit short and thick. Later, during training and on the track (he raced as a three year old for one season) this changed. But defnitely he was a very promising horse from the very beginning”. Soon the promise became reality Ekstern claimed success after success on the show arena and received the moniker of “undefeated”, which usually precedes his name. 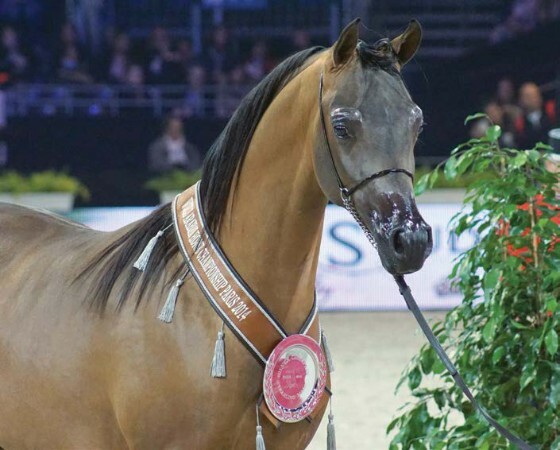 It is extremely rare to see a born show horse, but this is exactly the case. Professor Krystyna Chmiel wrote about him in her book “Tey formed beauty”1: “He has perhaps the shortest head that I have ever seen –I have personally measured the distance between his eye and nostril, which equaled the length between the end of my thumb and middle fnger. He is very. 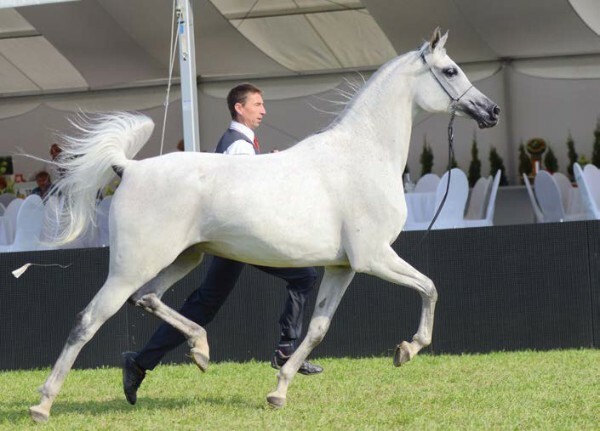 well coupled, with an ideally horizontal topline and a fying trot”.Ekstern has pride and fre within him and he likes to show, making it seem that he is playing with the handler on the arena. Young Ekstern in 2000. Stuart Vesty photo. 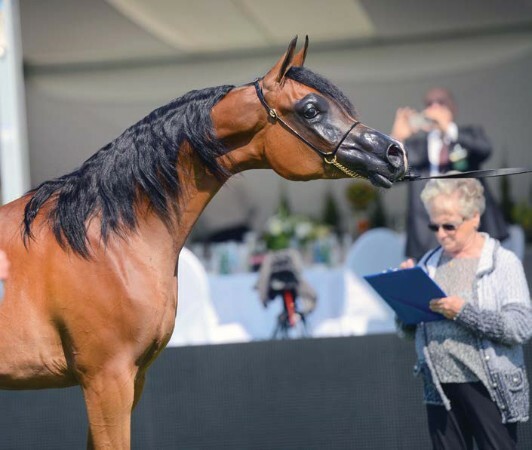 Pustynia Kahila, Al Khalediah European Arabian Horse Festival 2014.
that he was in the hands of a different handler and that Christine Jamar knows a lot about shows and knows what kind of a horse can be shown to what judges. After Ekstern’s first performance there was a general shock that it is a horse from Poland and not Egyptian. That was our strategy – an element of surprise. We repeated that concept in later times as well, for example with Emandoria. When we had a tough time breaking through we decided to lease her to Ajman Stud so that she would be shown by Frank Spoenle. Sometimes we do that to achieve a particular result. In the finals the differences can be measured by millimeters and who gets the gold, silver and bronze is determined by minimal nuances”. 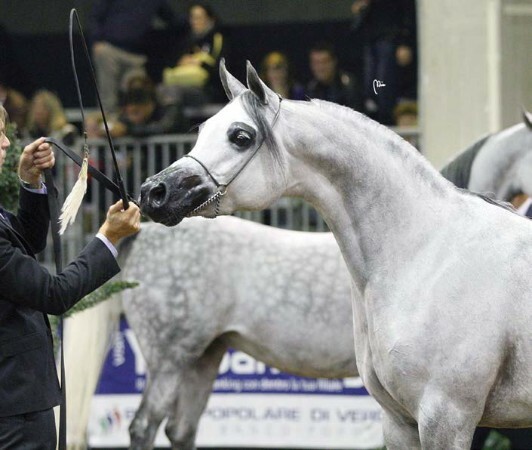 Years later, in 2008, Ekstern additionally received a challenge cup, the WAHO Trophy for best individual of the Arabian breed. 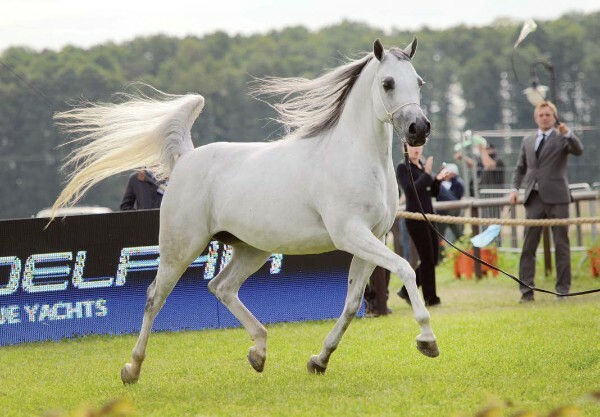 Psyche Victoria, Al Khalediah European Arabian Horse Festival 2014. 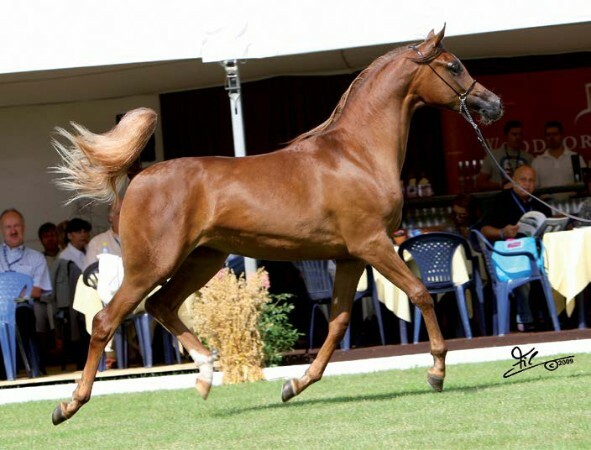 Equator, Al Khalediah European Arabian Horse Festival 2014. 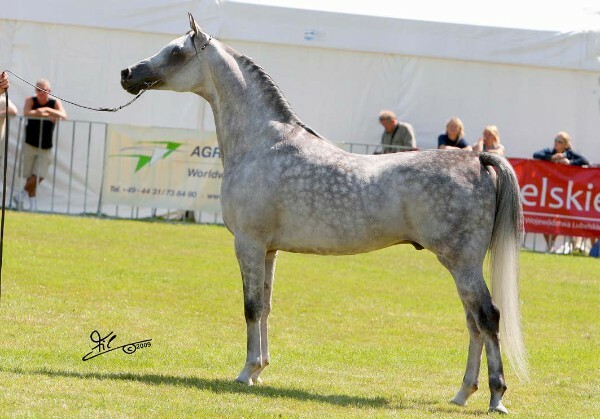 Mare Perfinka (Esparto – Perfirka/ Gazal Al Shaqab), Senior Silver Mare Pepita (Ekstern – Pepesza/Eukaliptus), Senior Top Five Wilda and Senior Champion Stallion Equator. Jerzy “George” Zbyszewski commented in “Araby Magazine”3 : “This attests to how valuable the daughters of Ekstern are in breeding; Pepita, apart from her own successes, can also boast the successes of her produce and we await Perfinka’s with great hope”. 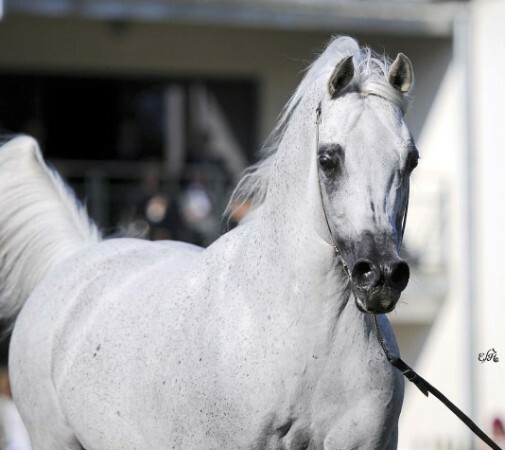 The spectacular success of Ekstern’s get in 2014 could not go unnoticed, but he proved himself as a valuable sire much earlier. In 2007 Professor Krystyna Chmiel4 wrote: “Dryness, combined with a muzzle like a baby’s pacifier, large eye and nostrils, a topline close to a geometrical straight line and impressive showy movement, with a suspension phase and tail set high like a flag or thrown over the back, were traits that typified the silhouettes of yearlings and two year olds by Ekstern”. During the Białka Junior Spring Show that she wrote about 61,8% of his get made it into the class top fives (15 out of 22). Up to 2014 Ekstern became the sire of 416 foals registered in the PASB, as well as those foaled as a result of his lease. Year by Year When the get of Ekstern appeared on the arenas of Polish National shows, did everyone feel the oncoming “change of guard”? 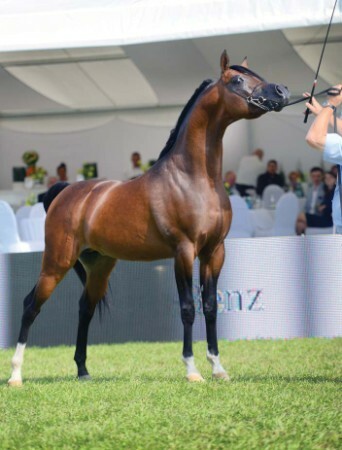 “His get was definitely visible, though we were not so overwhelmed as when the get of his sire made their debut, when Ekstern entered the arena”, says Mrs. Anna Stojanowska, the President of the PAHBS and an international judge. “The sons and daughters of Monogramm as yearlings not only won their categories, but placed from first to tenth in their classes, giving their rivals no chances. It was like a hit in the head, we knew immediately that Monogramm just opened a new era in the history of breeding. But the appearance of Ekstern’s get was also noticed and step by step won over the hearts of the spectators and judges. and class, handsome head set on a nicely chiseled neck, wide forehead, beautiful eye and wonderful tail carriage. The many year director of Janów Podlaski, Andrzej Krzyształowicz, spoke about his extraordinary Arabian beauty, pretty head, large, dark eye, wide nostrils, nice neck and good body. Ekstern’s dam Ernestyna by Piechur (1989) is a representative of Michałów’s world famous damline of Milordka (~1810, Sławuta), called often the E-line. Her dam Erwina by Palas descended on one side from the Egyptian Aswan (Nazeer – Yozreia) and on the other from the afore mentioned Wielki Szlem, through his daughter Ellenai (1956) and the outstanding Amurath Sahib through his daughter Estokada and graddaughter Estebna by Nabor. Estokada (out of Saga by Hardy), who – as Professor Chmiel writes in the afore quoted book “They formed beauty” – inherited from her dam’s sire, a pre-war Derby winner, stamina (she placed first among her crop, winning eight races, including the Oaks and Criterium St.), gave racing produce with racing sires and handsome produce with handsome sires. And so three full sisters by Nabor: Eskapada, Estebna (1961) and Edycja “condensed in themselves the maximum of beauty and finesse, attributed mostly to the Saklavi type”. The “Nabors”, called by the renowned photographer Marian Gadzalski as “dancers”, became white very early on, they also had heads with a dished profile, large, dark, widely set eyes, long necks, were dry and impressive, especially in movement when they presented a highly set tail. These traits were accumulated to the maximum in Estebna, who in 1973 became European Champion. A year later she died much too soon, leaving daughter Elwira (by Elf ), great-granddam of Ernestyna. 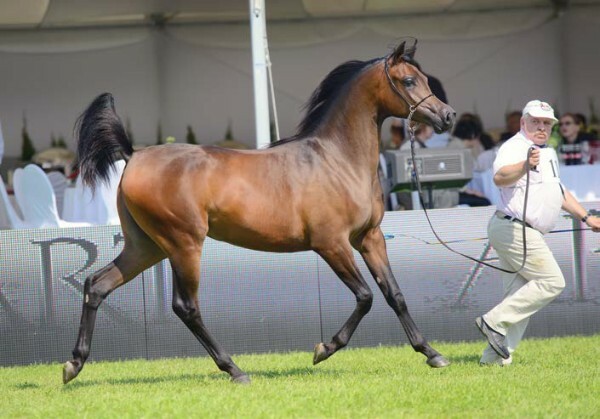 The future belongs to the dams Huge hopes were associated with the highly decorated Ekstern son Esparto, the sire of Perfinka, leased by Al Muawd Stud (Saudi Arabia), under whose banner she achieved world fame. “Esparto was to be Ekstern’s heir”, confirms Director Białobok. “His get in Białka gave a lot of hope”. Unfortunately after several months of recovering after a hard case of laminitis and surgery that he underwent in Germany, at Ismer Stud, Esparto passed away. 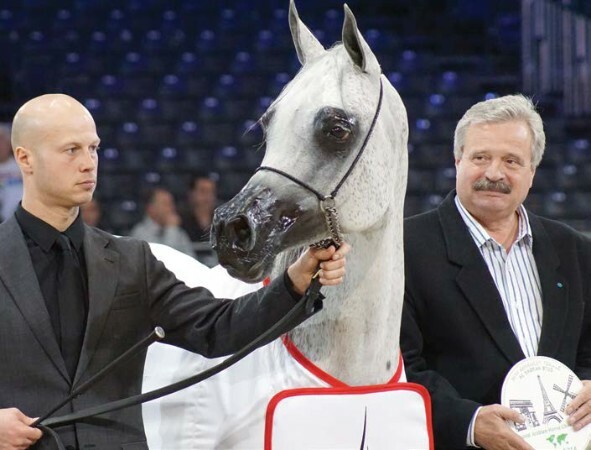 As Michałów’s director says, there is no stallion in sight that could take over Ekstern’s duties now. 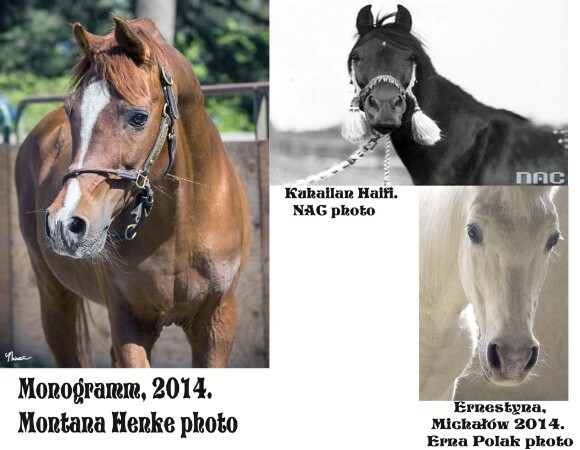 Therefore even more valuable for breeding are then the daughters of Ekstern, who pass on the legacy of Monogramm and Estebna, guaranteeing that the term “Pure Polish”, arousing general respect in the world, will not be just an empty slogan.